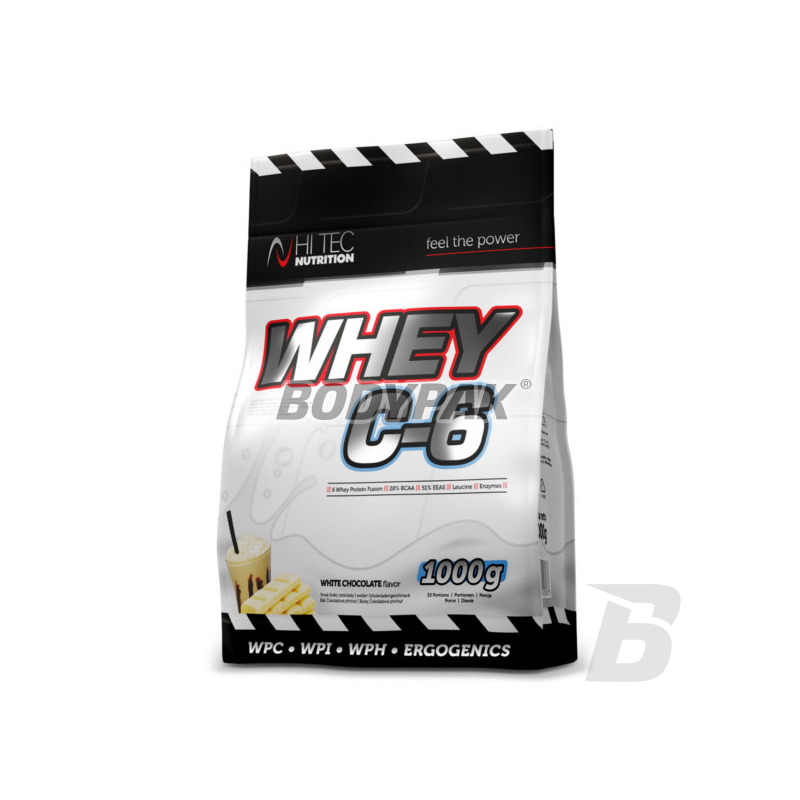 Hi Tec Whey C6 advanced, highly anabolic preparation of high-protein (85% protein in dry matter, with a high biological value: BV from 104 to 159) contains a unique set of whey protein. This is an ideal source of protein in the diet of any athlete and active person. The product provides a constant supply of weaving called "essential amino acids" (50%) of the branched chain amino acids (25%). With this nutrient not only you deliver your body with high-quality building material for muscles but also you ensure faster postprandial regeneration and protection against catabolic processes. A key aspect is the significant addition of anabolic L-leucine and L-glutamine, which significantly affect protein synthesis processes of the body and support the proper functioning of the immune system! VERY HIGH PROTEIN, INCLUDING AMINOACID EAA AND BCAA. APPENDIX L-leucine and L-glutamine. SUPPORT FOR THE post-workout regeneration and immunity. Whey C6 was also anabolic enriched amino acids L-leucine and L-glutamine as well as potentiators of digestion and absorption of proteins (proteolytic enzymes pineapple and papaya) and β-ecdysterone, which repeatedly increases the use of amino acids for the production of muscle proteins. Hi Tec Whey 6 is extremely versatile nutrient that provides complete protein, which is absorbed in a short and ensures a steady stream of amino acids into the blood. This is possible thanks to the different sources of protein, of which there are up to 6 and different absorption kinetics. After preparation 15 minutes after ingestion it is released into the bloodstream. Adequate nutrition is essential in any sport, so what better product in its class! EXCELLENT TASTE. Rapid absorption. APPENDIX digestive enzymes. Great tasting protein and no problems with its solubility is essential for high comfort and satisfy your taste buds. This dietary supplement has been fully thought out and polished - as this aspect is at the highest level. Every serving is a pleasure in liquid! 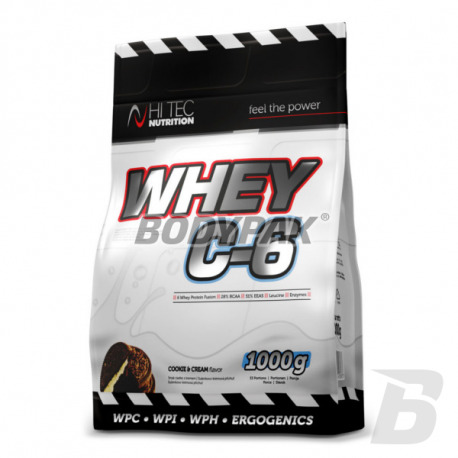 HI TEC WHEY C6 - YOUR SOURCE OF PROTEIN! NOT FIND BETTER IDEAS! Napisze krótko: duze opakowenie, stosunkowo niska cena, duzy spektrum smakow do wyboru. 6 frakcji białek. Mala ilosc tluszczy i weglowodanow na porcje. Ok 25 gramow białka na porcje. Smak bananowy jest jednym z najlepszych jakie piłek. Sama odżywka jest całkowicie godna polecenia. Rewelacyjne białko z fajnymi smakami. Dla mnie to wystarcza, tym bardziej że wszystko działa jak powinno i widać, że ciało się buduje. Nie miałem problemu z rozpuszczaniem, dla mnie pod tym względem nie ma się do czego przyczepić. Bardzo dobry smak (kokos) i rozpuszczalnosc, dobra regeneracja, polecam !! !